Day 213 / Hat 213: Red velvet Santa Claus cap with white faux fur trim and jingle bell detail. 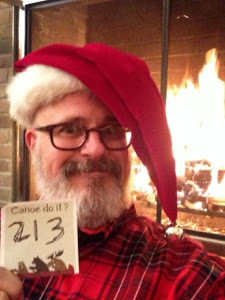 Taken in front of a roaring fire made of my own hand for strategic purposes -- there's only room for one Claus in this Casa! This Santa lid actually belongs to Bear -- the somewhat life-size stuffed bear with poseable paws that currently resides in the Garlodge. Bear and his holiday hat came into our possession many years ago when we were spending our first Christmas on the West Coast (living on Larrabee Street in West Hollywood at the time) and came home to find Bear -- in a humongous box -- standing in front of our apartment door. The sender? My father-in-law. Bear and his jaunty (and exceedingly high-quality I might add) Santa Claus cap epitomize the true spirit of the holiday for me. Today's tip o' the Christmas cap, therefore, goes to my father-in-law (aka "the Admiral").